Castleford Tigers will host local rivals Featherstone Rovers in a traditional festive friendly on Sunday, December 30. The game will take place at the Mend-A-Hose Jungle and will kick-off at 1.30pm. Featherstone came out on top when the two sides met last Christmas, recording a 32-16 victory with the help of two tries from Scott Wheeldon. 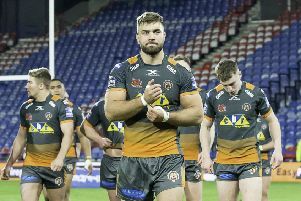 Tickets for the match will be available to buy from the Tigers Den club shop in Carlton Lanes, Castleford Tigers’ Sports Superstore at Xscape Yorkshire and on the club’s website. Alternatively, tickets can be bought from the Rovers Superstore and online shop, from tomorrow. Unreserved seating will be available for purchase pre-game from the Tigers Den in Carlton Lanes with an extra charge of £3 per seat.